Exploring Washington, D.C. with a toddler can be challenging, but fortunately, the most popular attractions for young children offer a lot to hold an adult’s attention too. The National Mall has plenty of pedestrian-friendly areas where you can have a picnic and enjoy the scenery. There are special exhibits for children, carousels to ride. and zoo animals to visit. There are places to run and play and even a bus tour that will appeal to the little ones. Many of the museums have hands-on exhibits for families providing a fun and interactive environment for all ages. Pace yourself and build in naps and rest into your itinerary! While visiting the iconic landmarks requires a lot of walking, young children can easily move around as you marvel over the historic sites of Washington, D.C. The monuments and memorials are beautiful and even the youngest visitors can appreciate these national treasures. For little ones, there are stairs to climb and huge faces to look up at like at the Lincoln Memorial. Older children will be impressed with the history some of the monuments depict. The National World War II Memorial has representation from all the states and honors the 16 million service members who served during WWII and the more than 400,000 who died. For those whose grandparents lived during this era, the monument offers an opportunity to reflect and connect their stories with this time in history. The tall ans iconic Washington Monument makes an impressive backdrop for a family travel photo and will re-open in 2019 after being closed for renovations. "Wegmans Wonderplace" is an interactive Smithsonian exhibit designed specifically for children ages up to 6 with age-appropriate activities. Young children can cook their way through a kid-sized Julia Child’s kitchen, find the owls hiding in the Smithsonian Castle, and skipper a tugboat based on a model from the museum's collections. The space is closed on most Tuesdays and on holiday weekends, timed tickets may be required. Toddlers love to ride the carousel on the National Mall and it provides a great diversion from traditional sightseeing as well as some wonderful views. The carousel is located near the Smithsonian Arts and Industries Building and is open year-round, weather permitting. There are more carousels in the area that are a treat for young and old. Visit the carousels at the National Harbor, Glen Echo Park, and Wheaton Regional Park. The immersive, hands-on installation at the National Building Museum is designed for young children and fun for all ages. It features molded foam blocks of all shapes and sizes and an original virtual block play experience. The exhibition combines a presentation of the Museum’s world-class Architectural Toy Collection, a hands-on block play area, and an original digital interactive that allows visitors to fill an entire wall of the exhibition with virtual blocks—and then knock them down. The National Zoo is one of the best destinations for young children in Washington, D.C. The 163-acre zoological park is home to more than 400 different species of animals and offers many hands-on opportunities to get up close to your favorites. Admission is free and there are many special programs available throughout the year. To avoid crowds, visit on a weekday when older children are in school. Indoor playgrounds and amusement centers offer a variety of activities for kids of all ages. They are great places to visit on cold, hot, or rainy days. The Washington, D.C. area has a wide variety of indoor play spaces. One fun center, Adventure Park USA in Monrovia, Maryland, is a western theme park with Go Karts, mini-golf, bumper boats, climbing wall, and soft-play playground. Older children will enjoy the arcade games while the little ones can ride the carousel, mini helicopters, and teacups. 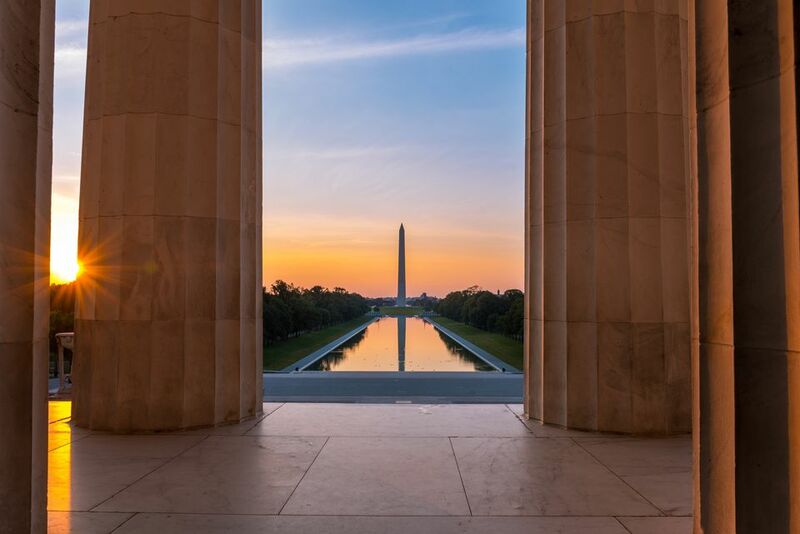 The double-decker Big Bus tour offers great views of the White House, the Capitol, the national memorials, National Cathedral, Arlington Cemetery and more. This is one of the best sightseeing tours to enjoy with kids because they can take in the sights from the open top deck. The Big Bus lets travelers hop on at any one of over 40 spots. A guide, as well as some recorded audio, will give you all the details of every sight you pass by. When something interests you, hop off and take your time exploring until you’re ready to re-board. It's great for the little ones with short attention spans. The Washington, D.C. area has lots of green spaces to enjoy fresh air and outdoor recreation. Have a picnic and allow your child to run, jump, and play in the capital region. Places like the Friendship "Turtle" Park in the capital, have great playgrounds. At this park, there are plenty of slides, swings, tunnels, a sandbox with turtles, and climbing structures. There is also a fenced area with shade, benches, and picnic tables where you can have your meal. At the 3-acre Kalorama Park, there is a recreation center which hosts events for children including a Valentine's Day party, Halloween party, winter holiday events and a summer day camp. It's fun to peruse the community garden during the summer and see what's growing. Nature Centers provide kids with lots of hands-on opportunities to explore our environment. Year-round naturalist guided programs will give you insight into the natural habitat of the Washington, D.C. area. Check the schedules and look for programs geared toward young children. At Rock Creek Park, the nature center offers exhibits, guided walks, lectures, live animal demonstrations and the "Discovery Room," a hands-on exhibit for children ages 2 to 5. Rock Creek Planetarium offers 45 - 60-minute programs exploring the stars and planets. A "Young Planetarium" show is offered Wednesdays at 4 p.m. and is ideal for the little ones. Story hours are a great opportunity to engage children in reading at an early age. Public libraries offer story hours and special programs to introduce young children to books, rhymes, music, and other fun activities. The whole family will enjoy the U.S. Botanic Garden which offers a scavenger hunt where older kids head off to identify plants and get their passports stamped. Little ones will enjoy the Children’s Garden where they can play in the playhouse, pump water, go digging, and water the plants. The National Garden includes a First Ladies' water garden, an extensive rose garden, a butterfly garden, and a display of a variety of regional trees, shrubs, and perennials. At the National Museum of the American Indian, kids will enjoy the ImagiNations Activity Center. They can play with drums and go inside a traditional Native American home. "Hok-noth-da for Families" storytelling activities are held each Sunday from 11:15 to 11:45 a.m.
At the museum kids can experience different modes of indigenous transportation and sport, weave a giant basket, and learn about basketweaving's history. After going through the museum, dine at the Mitsitam Native Foods Café and sample foods from different Native cultures.